Anthem BCBS and Colorado Choice (Friday Health Plans) are the only insurance carriers offering individual/family plans in Washington county. Akron is the largest town in Washington county. Anthem BCBS has 2 unique providers in Washington County. Anthem BCBS has 0 unique facilities in Washington County. Anthem BCBS has 2 total unique providers + facilities in Washington County. Bright has 0 unique providers in Washington County. Bright has 0 unique facilities in Washington County. Bright has 0 total unique providers + facilities in Washington County. Cigna has 0 unique providers in Washington County. Cigna has 0 unique facilities in Washington County. 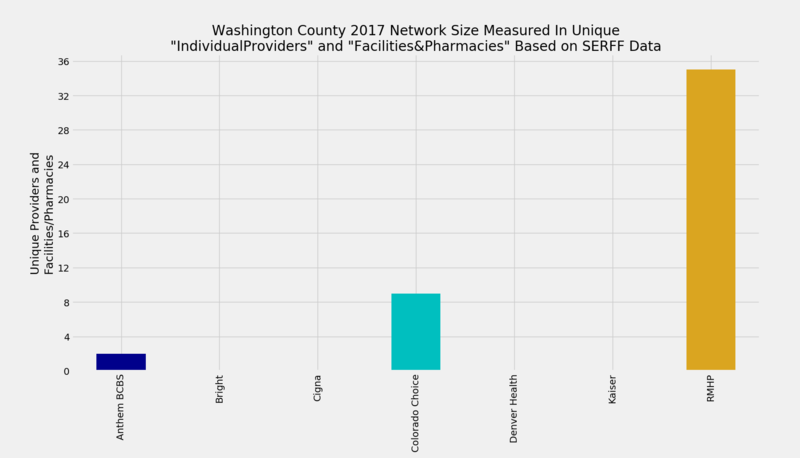 Cigna has 0 total unique providers + facilities in Washington County. Colorado Choice has 9 unique providers in Washington County. Colorado Choice has 0 unique facilities in Washington County. Colorado Choice has 9 total unique providers + facilities in Washington County. Denver Health has 0 unique providers in Washington County. Denver Health has 0 unique facilities in Washington County. Denver Health has 0 total unique providers + facilities in Washington County. Kaiser has 0 unique providers in Washington County. Kaiser has 0 unique facilities in Washington County. Kaiser has 0 total unique providers + facilities in Washington County. RMHP has 35 unique providers in Washington County. RMHP has 0 unique facilities in Washington County. RMHP has 35 total unique providers + facilities in Washington County.